It’s time for a weekend competition. This one features Mark Tanner’s new book, Mindfulness in Music: Notes on Finding Life’s Rhythm (pictured to the left). If you’ve been reading this blog over the past week, you’ll have read Mark’s own post about this publication, which provides a useful background (to read it, click here). Published by Leaping Hare Press, this volume will be of interest to anyone who feels the need to reflect on the inner rhythms of their life, and perhaps find a different approach to hearing and digesting music. Chapters focus on the following subjects; Music as Meditation, The Rhythm of Life, Sound & Sensuality, The Language of Music, Parallel Universes, and the The Art of Possibility. Beautifully presented, the book contains interesting quotes from various artists, writers, philosophers, and musicians, and I particularly like the suggested mindfulness exercises which are peppered throughout. These offer food for thought, and allow our minds to put Mark’s many theories and ideas into practice. A thought-provoking read! I have two copies to giveaway this weekend, so, as always, please leave your comment in the comment box at the end of this blog post, and I will announce the winners on Monday evening (British time). Good luck! 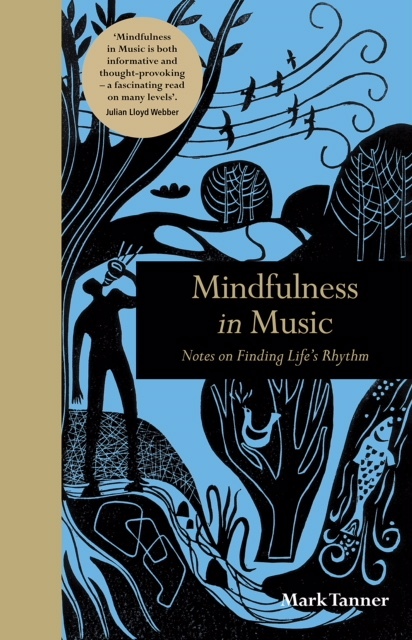 You can purchase Mindfulness in Music: Notes on Finding Life’s Rhythm, here. This sounds like very relevant topic to me….I’d love to read this! I think I need this badly!! I would love to read this book and develop my engagement with the piano. I’m halfway through The Mindful Pianist and really enjoying putting some of his ideas into my practice sessions so I would love to be able to follow it up with this book. This seems like essential reading for my own personal development. This of particular interest to adult piano students, because the greatest obstacle to progress for us is all the distractions of adult life. One of favorite books (not written for, but useful for pianists) is Zen in the Art of Archery. Mindfulness in Music would be a wonderful companion. Hi Melanie, this sounds like a most enjoyable book to read. Just the thing to read on the patio over the course of the summer. My piano teacher and I have had several conversations about the effects of music being omnipresent in our busy lives, and how we forget about its creators who put in a lot of years of studyng and many long hours to produce this music. We also talk a lot about how music seems to have become a free commodity. Sure would like to read this book. I suspect that one of the reasons I enjoy practising so much is that it allows me to press hold on the immediate pressures of life, and to focus instead on something deeply compelling and personal. This is something which I do my best to pass on to my students as well. Fascinated to see what Mark has to say on the subject. I would love a copy of this book to gain more understanding of how music can bring light and inner peace in this vibrational universe. Working with people with Bipolar disorder and ADHD, I can see this book would help me provide a new approach to teaching and learning for them.